As Israeli Prime Minister Ehud Olmert engages in what may amount to peace talks with PLO Chairman Mahmoud Abbas, the other Palestinians in the Gaza Strip are doing everything possible not just to harm Israelis physically, but to also capitalise on political uncertainty in a hope to stall all prospects of progress by bringing down the government. Yesterday was the start of the school year in Israel and it has been characterised by debate over whether the Israelis in Sderot would send their kids to school. The parents argued that Israel has not done enough to protect their kids from incessant Kassam fire but the government argued that the schools were safe enough. This played nicely into the Palestinian hands. Yesterday Palestinian terrorists fired 9 Kassam rockets into Sderot, including one that landed outside a day care centre for young kids. 12 school children were treated for shock. The Jerusalem Post reported that Islamic Jihad claimed responsibility saying that it was a "present for the new school year." 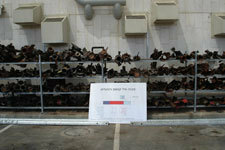 On my recent trip to Israeli we were lucky enough to visit Sderot. 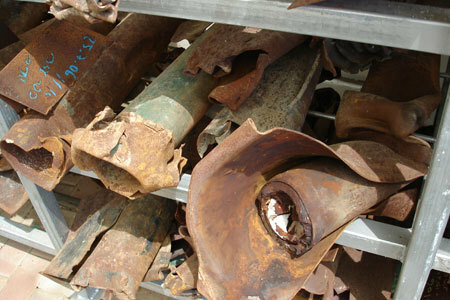 Sderot is a small working class city and lies just 1 km away from the Gaza strip. Most of its residents are of North African origion, mainly from Morocco. 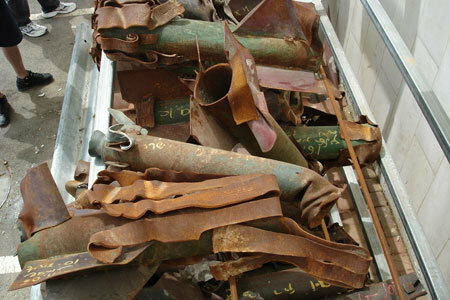 Since the beginning of the al-Aqsa intifada Sderot has been the target of thousands of Kassam rocket attacks. 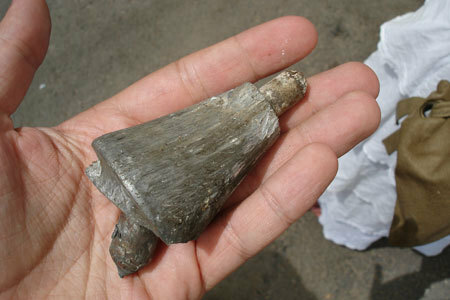 Since the Israeli disengagement from Gaza over 3000 Kassams have been fired into Sderot. We arrived on a stifling hot and humid summer's day to find out that earlier that morning a Kassam was fired and landed in an empty field some distance away. Most of the Kassams land in empty fields. Our guide compared them to massive mosquitos, constantly biting away causing a more psychological than physical damage. However, the few that do hit their targets are certainly not minor mosquito bites. They kill, dismember and terrify. 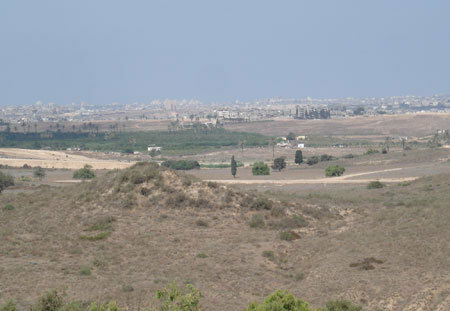 Here's a shot of Northern Gaza from a hill in Sderot. The green area in the distance is Beit Hanoun – the area from where most Kassams are launched. (You may remember the tragic incident last year when IDF shells responding to Kassam attacks inadvertently killed 18 Palestinians in Beit Hanoun.) Beit Hanoun is just 3 km from Israel. The surveillance blimp overtop is used as an early warning measure for Kassam launches. Once a Kassam is launched the siren screams and Israelis have between 10 and 20 seconds to find a shelter. Here's a zoomed in shot from our Sderot hilltop. 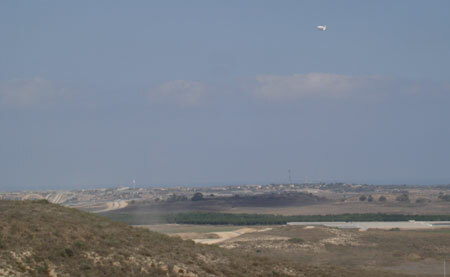 The second dusty road in the distance is the border between Gaza and Israel. This is the north eastern section of Gaza. The small map on the left shows you where Beit Hanoun is. 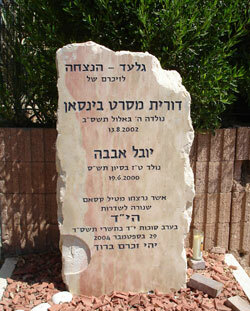 A memorial for two Israelis toddlers (4 and 2 years) who were killed by a Kassam that landed in their front yard (more about this memorial here). Our guide was the first person to find the bodies of the children. 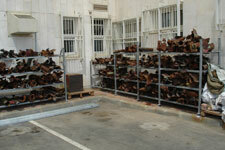 We visited a police station in Sderot where they display the remains of hundreds of Kassams that have been fired. Over three thousand have been fired since Israel withdrew from the Gaza strip. Below are some shots of the twisted remains of Kassams along with a description of their structure. 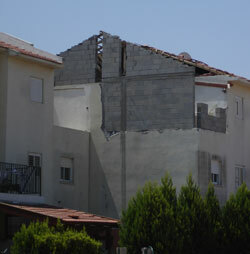 This house took a direct hit by a Kassam and is being repaired. 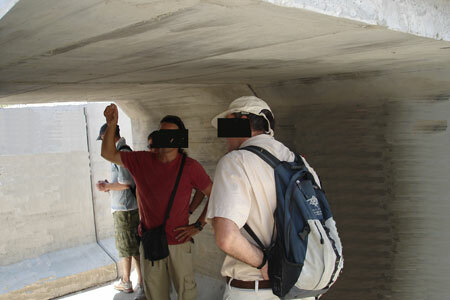 One of the many shelters that litter Sderot. The structure was not designed to be a shelter. It was actually designed for huge water tunnels. 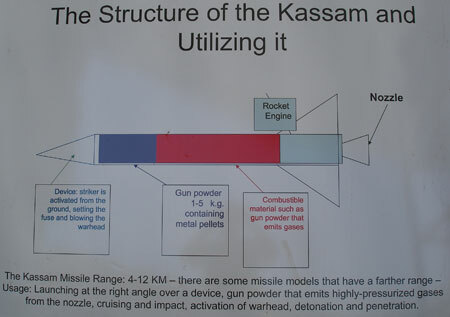 The shelter will provide protection if a Kassam lands in its vicinity but it is useless in the event (however low the probability) of a direct hit. Inside the shelter. The image looks a bit distorted because I used the Photoshop clone tool to clone out some folks who don't want to appear in a photo on some arb blog. Peering out through the shelter. Here's a video of the Kassam that landed outside the day care centre. You can feel the horror of the residents as they run for cover. Click the play button. Haim Ramon made a good point today, reported by JPost, regarding cutting water, electricity and fuel supplies to Gaza. His point was essentially, in my opinion, pure logic. How can we continue to supply these people when they continue trying to kill our children? I cannot fathom how Israel has any moral, ethical or legal obligation to let the fine residents of Gaza do anything but but die of starvation, thirst, cold and drowning in their own sewerage. These people voted in Hamas whose policy even at the time was to kill us. And if one thing can be said they're trying very hard to keep to their word. Their little coup only strengthened the control gave them absolute control of - and therefor responsibility for - Gaza. Providing them with the continued to fight a war with us is not humane its idiocy. 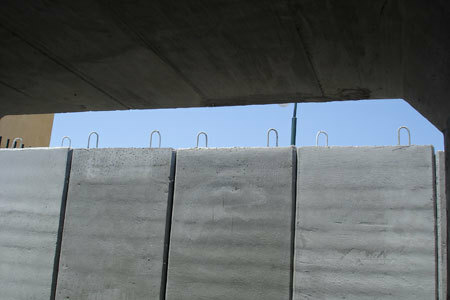 Khaled Abu Toameh from the JPost reported yesterday that it looks like there is an armed uprising in Gaza against Hamas. There was a photo of a rock wielding Palestinian throwing a rock at a Hamas opponent. Quite an historic image. You talk of logic and idiocy. With regard to any other state... But in the case of Israel, the way the world acts toward it is aptly summarized by the name of this very website (or take off that "almost" if you're a believer). I am sure the football (soccer) fans amongst your readers will be able to recall memories of a superb goal on the field being accompanied by "you know that will be in the top 10 for goal of the season come May" from Martin Tylor. May I be the first to state, that this posting will be in the top 10 for post of the season come the blog awards. Superbly informative and so thorough. Thanks for the incredible service gents!! I may not agree with your political leanings sometimes - but WOW, you make such a difference to the ability of South African and world zionists to understand the conflict. There seems to be Arabic writing on some of the rocket casings. Can anyone tell me what this writing says? I note that during times of war active soldiers have written messages over bombs and missiles - I'd just like some more insight over what is written here. Anyone got any idea? Is it possible to ask the people who pick up the remnants of these missiles to translate? I would be very interested to hear what these messages say. Thank you for posting these pics, which the hate-America-hate-Israel hatemongers/blind would Rather(TM) never depict. Those pics really say a lot about who we're up against and those who support them. Very powerful essay, well done. Gersh, Joel, mortfaucheur - Thanks. Drk - I have uploaded an additional image where some writing is clearer to see. The writing has alot of numbers and in some cases seems to be Hebrew. Perhaps descriptions added by Israel after they fell for record keeping purposes? Some of the writing is Hebrew and looks newer, the older yellow writing seems to be arabic. "We really want peace and a two-state solution with secure borders, we do not want to kill all Jews, which is why we're only sending these innocent "home made" projectiles at nursery schools on the first day of class. Let's "negotiate". Lot's of love, your new neighbours, Hamas. P.S. thanks for Gush Katif we had fun destroying it, it definitely helped us "strengthen" the moderates ... off the roof of the building. P.P.S. death to the zionist entity. P.P.P.S. ahmadenijad and nasralla send love too"
Maybe it's just me, but treating blogging like it has the same emotional commitments and attachments as real life is something I can't understand. For me, Al Gore's invention (wink) is just a tool. As far as cutting off food, water and power to Gaza, I agree that they don't deserve it, but I also think that Israel is playing the right hand by continuing to provide it, so that they can retain the ability to hurt Hamas by cutting them off at will. This issue of Bitterlemons (Yossie Alpher at least) touches on your thoughts. yeah congrats on being featured at LGF. I'm sure the M&G, and the rest of the SA media were quick to condemn this act of Palestinian terrorism on their front pages, like I'm sure it will be raining frogs over Joburg tomorrow. I've been in Israel a year now btw, still practically on the Lebanon border. On a somewhat depressing note, I find the Jews here in Israel to be as clueless on average about the nature and extent of the jihad bent on annihilating us all as so many Diaspora Jews are. The denial here is as bad as it is in the Diaspora, something I did not expect. I mean how do you explain Ha'Eretz otherwise? Most of the Jews in Tel Aviv are like the Jews in NY, California, Toronto, Cape Town, Sydney, clueless know-nothing PC pseudoliberals. It is so depressing, and dismaying. the truth is too terrible to face, so they don't face it. Considerable levels of self-loathing too, just like back home. I thought Israeli Jews were not as meshugena as the rest of us, they can't afford to be, but they are. I'm sure you have noticed vast differences in Israelis. As was discussed here not long ago its hard to define the 'typical' Israeli stereotype. The same differences exist in levels of appreciation the global geopolitical situation. To describe the Jews here as "clueless" is to miss this point. Usually my opinion on sweeping generalizations is less than liberal - where there is smoke there is fire and stereotypes exist for a reason. But I feel that this is an exception, there are such large segments of the Israeli population that are clued up that one can no longer generalize. That said the level of ignorance one does find is a disgrace and rivals even the most hick, country bumpkin, redneck, South Carolina automechanic. 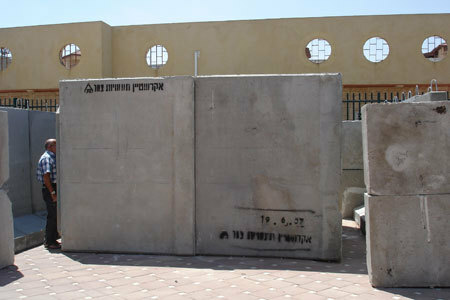 As far as I can see, the inscriptions on some of the Qassams are dates and addresses (probably of the rocket strike). good blog entry! i will be honest, this is one of the first time i've seen a video of israelis running for cover during a quassam attack. I wish they would show it on the news here... maybe people would open their eyes.